Looking for a compact stacker for low-intensity applications? Weighing just 467kg, being exceptionally compact, and thanks to the low noise level generated, this powered stacker truck can be used in a wide variety of applications. The low-maintenance and revolutionary AC motor offers great energy efficiency, as well as durability and strength. 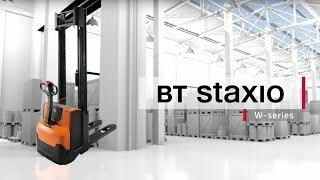 BT Staxio HWE models are light enough to be used on mezzanine floors and are ideal for low-intensity use in public environments such as shops and hospitals, especially with the low noise level generated by the truck. Used for picking orders and move pallets. You can also use it as a working station while pricing and packing customer orders. Individual operator parameters: maximum speed, acceleration and braking behaviour can be adjusted to suit individual needs.